Although the Legislature is not in session, I’m keeping busy with various committees that meet during the interim to address the management of our state-run pensions, and policies around aging and disability. During this month’s meeting of the Pension Policy Committee, we held a public hearing on cost-of-living-adjustments (COLAs) for members of a now-closed public-pension plan, in addition to discussing other proposals to keep the state-run pensions in good financial shape. You can view materials from that meeting by clicking here. I also serve as the co-chair for the Joint Legislative Executive Committee on Aging and Disability. We met recently in Olympia to review guardianship laws, discuss options for the financing of long-term care, and receive an update on our state’s plan to address Alzheimer’s disease. Click here to read the committee documents. Over my years in the Legislature, I have championed policies that protect vulnerable groups of Washingtonians, expand access to needed services, and put our state on solid financial footing. I’ve sponsored laws to empower families by requiring courts to look for alternatives to guardianship, in addition to expanding coverage for low-income Washingtonians to get hearing aids, and creating more stability for adult family homes. Serving you is the most rewarding part of this job. While doing my exercise routine I was fortunate enough to meet the vice president of the Puget Sound Chapter of the Little People of America. 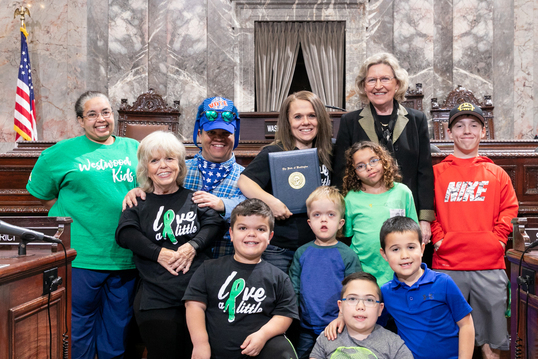 Together, we worked to get a proclamation from the governor declaring October as Dwarfism Awareness and Acceptance Month in our state. 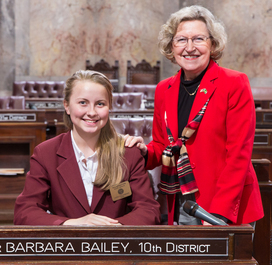 She and other advocates made the trek to Olympia for a ceremony and tour of the Capitol. Click here to read my press release and the proclamation here. I’m excited to announce that the Page program is now accepting applications for the upcoming legislative session that begins in January. Now, you can easily apply online! Click here for more information about the program and to apply. Please share this information with interested students.